A new and unique project to heal and inspire. 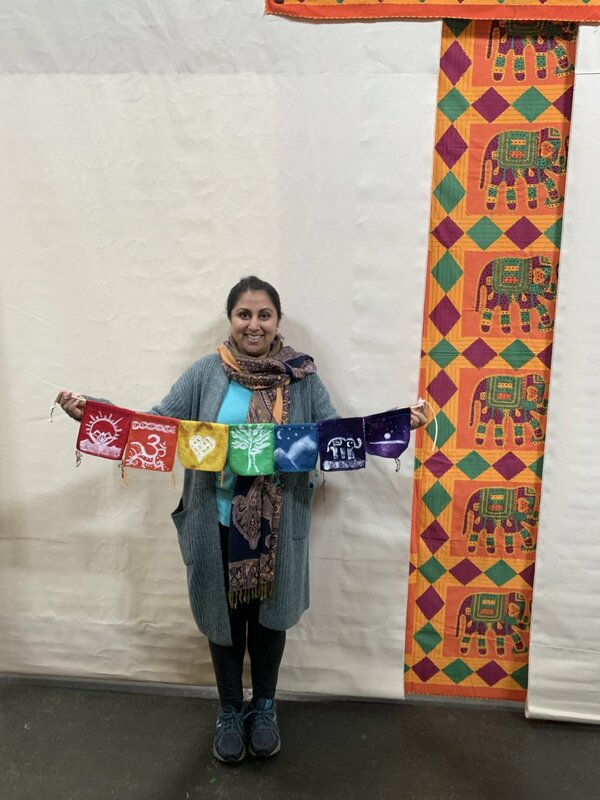 Rainbow Prayer Flags are inspired by traditional Tibetan Prayer Flags and the idea that each prayer or blessing is not meant for the gods, but for all life on Earth. I was moved by this sentiment because I truly believe it to be true and lovely. I also wanted a project to share that was a little less messy than the tie dye classes I have been doing for years, but something that was still HANDMADE and interactive. In November of 2018 I went on a cabin trip with several artist friends and was asked to provide an activity. A friend and I collaborated on this project, (I dyed and cut the fabric, she finished the edges and provided the suede and some other notions) and it went over great. When I had more supplies, I let my family know we would be doing an art project over Thanksgiving break. During that time, my family had been experiencing an emotional time due to the passing of a beloved uncle. 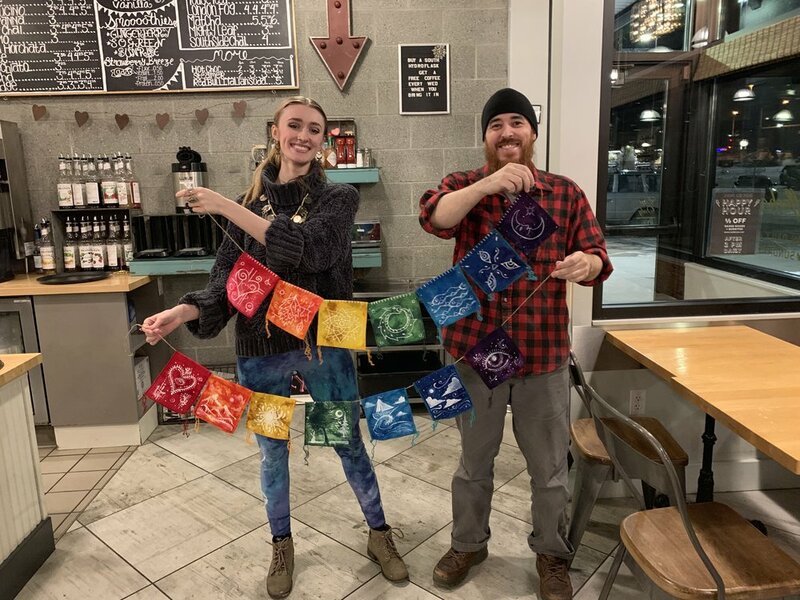 It brought many feelings to the surface and another uncle of mine, his brother, created a beautiful prayer flag that had many of us in tears when he took the time to explain the meaning behind his art. This man does not “art” much, but he is an amazing man full of love and compassion and wisdom. Though his flags looked like a kid had painted them, his set of Rainbow Prayer Flags told a story of his love for family, his undying love for his wife, his promise to be here for us (even after his life here on Earth, and instructions on how to contact him after) his respect and honor for his ancestors, and his hope and faith for us and the generations to come. During that time I began to realize the therapeutic benefits I could help facilitate with a project like this. With the support of my tribe I decided to share this with the world. I am blessed to have a wonderful friend who allowed me to use her sewing machines to create 1,500 (over 200 sets!) flags and brought them with me on an epic adventure to visit places I’d never seen and meet strangers who would become friends, even for just a couple hours. I am offering this colorful adventure in the following places in 2019. Contact me for more info!